Nothing beats heading to London to go and watch a musical on the West End. The excitement of going up on the train and spending a day there to sit in a fantastic theatre and be amazed for a few hours. But for most of us, going to London can be pricey. So I'm really pleased to see more and more shows heading on UK tours to allow people that can't afford the travel to head to their local theatres and see something spectacular. Here's a list of some of my favourite family friendly shows that are headed on tour this year. Matilda The Musical is a show that we have had our eye on for such a long time. Based on the hit Roald Dahl novel, it follows the story of Matilda, a girl who who dares to take a stand to achieve her dreams. With some amazingly catchy songs (the school song and quiet are my favourites!) and staging that is pretty mind blowing, it's definitely top of our list when it heads to our local theatre next year. Touring across the UK this year, the Matilda UK Tour is one not to be missed! 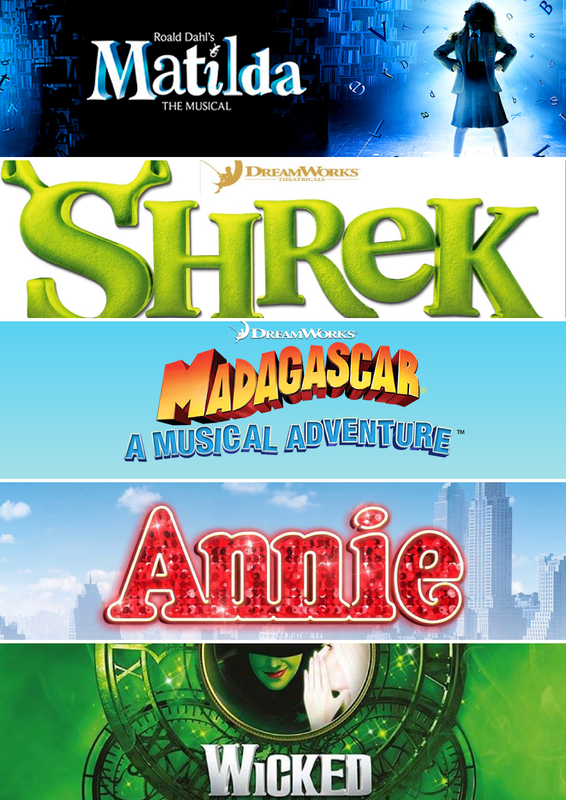 Shrek The Musical is based on the hit film that is known and loved by many. Following the story of Shrek the ogre who is sent on a mission to rescue princess Fiona with some unexpected twists and turns. The tour has only just kicked off and there are plenty of dates that the Shrek UK Tour is headed. I'm excited to take Max to see it at the Mayflower in Southampton as I've heard so many fantastic things about it. Madagascar The Musical is an unexpected musical in my eyes, but after watching some of the YouTube videos it looks like it's going to be a pretty fun show for families that are fans of the film. It's kicking off in summer 2018 and I think we might try and catch it over August when it hits the Kings Theatre in Portsmouth. I can't wait to see how they adapt all the animals to the stage, especially the penguins! Annie The Musical is a classic that we saw when it was first on it's revival tour a few years ago. We had a fantastic time watching Craig Revel Horwood as Miss Hannigan and honestly loved seeing this reinvention of the classic musical. It's heading on tour at the end of 2018 into 2019 and I think we might have to pop and see it again when it hits our local theatre! Wicked The Musical has actually been on tour for quite a while, but in October it is heading down to our local theatre and I'm hoping to be able to take Max in half term and then sneak in a grown up visit without him. It follows the story of the witches from the Wizard of Oz before they become the good and bad witches and it's a musical that I absolutely love!